Hana Kassem is a Principal at Kohn Pedersen Fox Associates, leading the design of a variety of academic, research, cultural, transportation, hospitality, and commercial mixed use projects in the United States, Europe, Asia, South America and the Middle East. Her design philosophy lies in the idea that design should fulfill social needs, creating dynamic and stimulating social environments. Some of the notable projects she has led with her colleagues include, the Red Hook Houses Resiliency and Recovery project for NYCHA, awarded an AIA Urban Design Merit Award in 2017, as well as the CUNY Advanced Science Research Center in NYC, a LEED Gold building that was awarded the AIA NYS Excelsior Award in 2015. Hana currently serves as a member of the Van Alen Institute’s Board of Trustees. A Registered Architect in the State of New York, she has served as Co-chair for the AIANY Global Dialogues Committee from 2014 through 2016, which received the AIANY Vice-President’s Citation for Public Outreach in 2015. 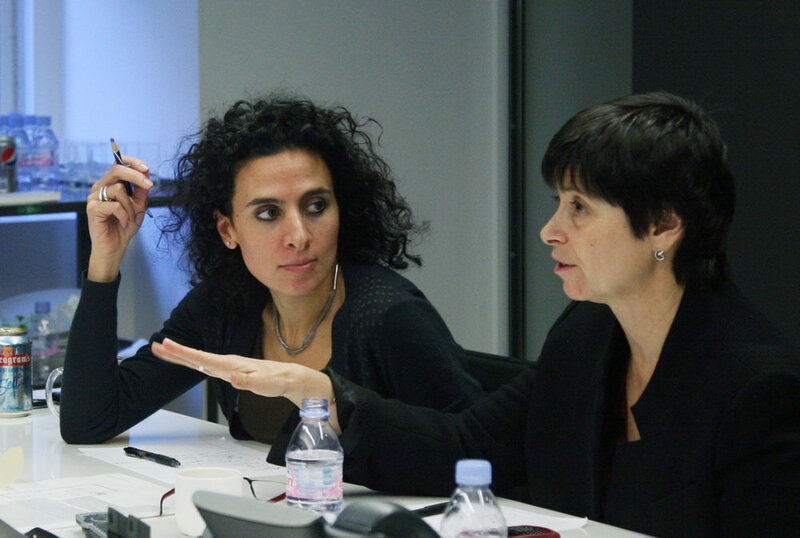 As part of the AIANY Global Dialogues sessions, she founded in 2013 the Leaning Out annual series on Women in the field of Architecture and Construction. She teaches as part-time faculty at Parson’s School of Constructed Environments, formulating studio topics that focus on an experiential engagement with our environment and programs that address marginalized communities. In her conversation with Julia, Hana speaks about motherhood and a global perspective, advising young architects to focus on developing their voice and being ambitious. HK: When I was about 11 or so, we lived in Iraq for a couple of years - my parents were UN diplomats, so we moved around a lot - and we went on a trip in the desert to visit this archeological site with a building that had a sunken courtyard. The space was completely striking to me - not only was it breathtakingly beautiful, incredibly detailed, and an incredible experience in terms of sequence and scale, but it also performed from an environmental point of view by significantly cooling the air of the courtyard through wind scoops. This really struck a chord, and is a strong memory for me - looking back at it, that was the first moment that I was aware of the power a space can have, both in terms of experience and function. What did you learn in architecture school? I went to RISD, and I first thought that I would focus on installation art in the sculpture department. Then my father said, “You’re good at science, and math, and art - why don’t you give architecture a try. If you don’t like it after two weeks, you can do something else.” So I tried it and was completely bitten by the bug. I loved it, never turned back, and never regretted. At RISD, the approach blurs the boundaries between art, architecture, and all the other disciplines that are taught there. That’s certainly something that I carry throughout my work. I’m always looking for a holistic experience, regardless of what discipline it falls into or what methods we use to achieve it. There is also a lot of foundation work that’s done in the first year of architecture at RISD where the focus is essential elements of space making as well as experimenting with materiality, and I always go back to these two things. As soon as I graduated, I left for Portugal to try to get a position at the office of Alvaro Siza – I found the poetry and simplicity of his work to be very profound and very much wanted to work for him. I was very determined; he didn’t do interviews from afar, so after a week of sitting outside of his office, he finally invited me in for an interview. Ironically, I happened to have lost my voice that day (foggy, humid, damp Porto weather, but I had my portfolio and I got the job. I was very lucky - I worked there for a couple of incredible years. Then I came back to New York and worked for Tod Williams and Billie Tsien for a few years, and that was also very rewarding. I admired their work and thought the experience would be a good complement to Siza’s office. 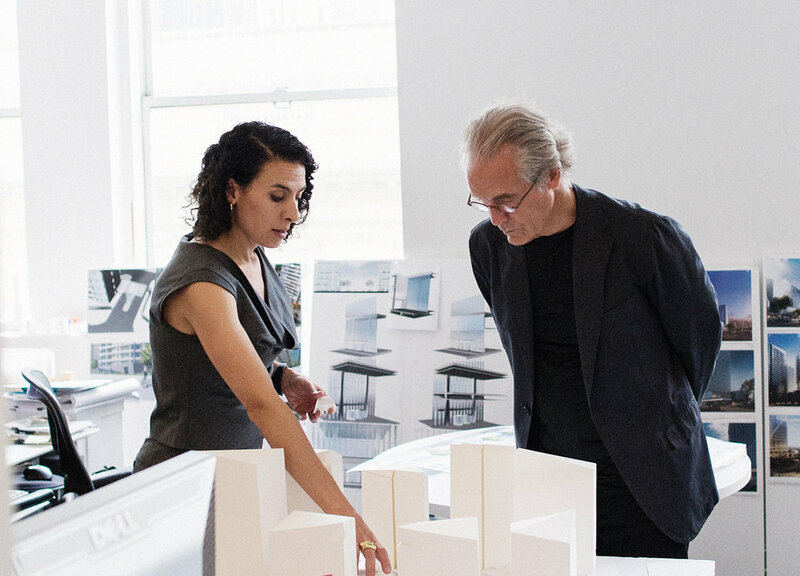 At Siza’s office, there were a handful of materials and details that we used, and those were set - we focused on other things, on spatial sequences, scale, and form - whereas Tod and Billie’s practice experimented with materials and detailing. After that, I worked very briefly with Toshiko Mori, and then I worked with my husband who is also an architect and also went to RISD. We did some residential work together, which he continues to do with his own practice. Eventually he stayed with it, and I joined KPF. Why did you want to come back to New York after your time in Portugal? My parents were positioned in New York through their UN career, and I always came here to spend vacation time with them. I always felt comfortable in New York - I never felt like I was an outsider or foreigner or an oddity, so that was my go-to in terms of landing somewhere. I continue to love New York every day. How did you get to KPF? I toured the office, and was really taken with the range of projects - both in terms of typology, location and in terms of scale. You could be working out a detail and working on a master plan at the same time, and I thought that was very exciting, a great way of exercising the different parts of your brain and staying sharp as a designer. That, combined with the global reach of the firm made it a great fit for me given my international background. Tell me about your time there. Pretty soon after starting at KPF I began on a project for a new midfield concourse in Dulles. That was my first position as a senior designer, a lot of responsibility, a huge learning curve, and the project was not 1km tall – as one might expect coming to KPF - it was 1km long [laughs]. Then 9/11 happened, the project shrunk and eventually stopped altogether. Following this I worked on a business school for Florida International University, which was awarded the Chicago Athaneum award and was a great collaboration with Bill Pedersen and Jill Lerner as well as the Dean of the school. I could talk about the importance of collaboration at KPF at length! It is fundamental to our work in all aspects. Then I had my first baby, my daughter! You start to date your projects with your children at some point [laughs], that’s when I worked on the Advanced Science Research Center at City College, which is part of CUNY. That project took about twelve years on and off, due to a few different factors, including leadership changes and such, but has been very rewarding and we’ve been happy to see it recognized through various AIA awards. Following this, I had my second child, my son, and after working on a lot of academic projects, I went into more commercial projects and mixed-use master planning projects abroad. I started doing longer travel for business trips, working in the United Arab Emirates, Mumbai, Brazil. My kids were very young when I started traveling far, and that was very challenging. They got used to it for sure, but it was tough. Team work session at KPF. My husband, especially having the flexibility of his own practice, is a huge support, and he really picks up wherever I can’t. He’s a true partner in that regard - raising the children, being able to be there, having flexibility with his hours. Without him, I would not be able to do what I do now. At this point what I’m excited about and what I’m grappling with is one and the same - something I’ve been thinking about since my school years - and it has to do with human-centric design, how we experience our built environment, and how our built environment affects us. Big picture, it’s thinking about how design can be more of a preventative rather than a reactive agent. We are reactive in our culture now - there’s a problem and we try to solve and remedy for it, but I want to know how design can be more proactive in terms of wellbeing, both social and physical. There’s a lot of work to be done but two particular questions are of interest to me - one has to do with what is universally experienced and what is more culturally driven and interpreted. The other is the bridge between cognitive and neuroscience and architecture that tries to look at not only how our environment affects us physically, but also emotionally, socially, and psychologically. Hana and a colleague at the Crystal Plaza Shanghai Lobby site visit. In terms of motherhood, I’ve interviewed both new moms whose kids are quite young, and moms whose kids have left home - you’re in a unique position because your kids, as pre-teens and teens, are at very tender ages. How is that? How do motherhood and career best integrate for you with kids at that age? The demands as a mother are very different. I feel that as they grow and gain more independence, they also need to come back to the nest and be comforted - there’s a push and pull that happens. You have to be there, you have to be accessible; they know my days are very busy and my evenings sometimes as well with work-related commitments, but they always call me and if I don’t pick up immediately I call them as soon as I can so that they know that I’m reachable. Even if I’m in China, they know that we can connect. I also find that it's important for them to see and understand that a person has to do something that they can be fulfilled by, devoted to, and passionate about. That way they can contribute more to the family and to society, and for kids to see that and see that yes, sometimes you need to compromise, but that you don’t let go of something you care very much about. Another thing I like to stress is that as a mom, it’s important to find time not only for family and career, but time for yourself as well. Think about it - you’re like the trunk of a tree and in order to balance everybody and all these branches, the trunk has to be solid and strong first. You have to take care of your own constitution and make sure that you’re happy. How do you do that? Do you still spin [laughs]? I run now more than I spin [laughs]. I do this in the mornings so that it doesn’t interfere with anybody. I still paint too - we try to do art Sundays at home, without electronics. It helps you focus in a very meditative way and those kinds of things are important. I’ve always danced my whole life as well - ballet, modern ballet, partner dancing - and I think it's good to take breaks and do things that involve other parts of your brain. Partner dancing teaches you to listen, interpret and improvise - to literally “think on your toes”. It’s very much an in-the-moment intense experience and like all such focused experiences, it’s very restorative. Some of the biggest challenges have had to do with the profile of female and ethnic minority architects in our field as something that’s not very well established. In a way, we are a minority within a minority. I can think of less than a handful, and the one that jumps to my mind first, Zaha Hadid, is no longer with us. I think that’s something that will eventually change, but in the meantime it’s difficult. You want to be there, you want to be heard, you want to be part of the table while preserving your individuality, and you also definitely want to make room for others. The more multifaceted and heterogeneous this profession can be, the richer it will become. Panel at the architecture film festival with Cathleen McGuigan, Hana Kassem, Claire Weisz, and Mimi Hoang. Leaning Out Panel at the AIA. On the other side, what have been the biggest highlights? The first has to do with our relationships with our clients. Architecture is first and foremost a dialogue, and it really blossoms when it’s fluid, direct, and genuine. As a result, you see it in the architecture that comes from that kind of relationship, and some of the biggest highlights for me stem from the direct appreciation our clients express when they feel that we’ve positively impacted their day to day life - to be able to do that is a huge privilege and something I and my teams really appreciate. I think it expands the role of the architect in the eyes of the client, and is a responsibility we have to the whole field, to demonstrate the immense value architects bring. The other is the next generation of women at KPF! They are fantastic - hard-working, talented, considerate, and ambitious - and I definitely want to support them in their path. I’m proud that KPF is a place that has been fostering the growth of these women - I’ve seen a big change in the past decade and a lot of it most recently with Jamie Von Klemperer as President of the firm. Worksession for the Red Hook Houses report. I don’t make long-term plans - I follow my interests and my intuition - but there are two things that always have to be happening. I need to be learning or deepening my knowledge in something, and I need to be enjoying myself. If a situation becomes such that I don’t feel either, then it’s time to make a change. If it’s a yes and a no, we work out the no part. This approach is something I’ve tried to relay to colleagues and junior architects that work with me, and it’s a helpful self-check. Am I having fun? Am I learning something? If yes, for at least one answer, then I’ll stick with it, and if no to both, it’s time to question. One, develop your own voice and try to hear yourself. Understand what your interests are and try to formulate a position. That’s not to say you can’t ever adjust it - being flexible is also important. Two, hone your presentation skills and express yourself clearly - to reduce things to their essential message and not get lost. Three, explore - go out into unchartered territory and don’t do something just because everyone else is doing it. Really try to investigate the best solution for each problem you may face, in design or in life. Four, use every day to learn something or deepen a skill in something, and five, be ambitious. Dream the reality - have a vision, convince people that it’s possible, and use your skills as an architect and a design agent to make it happen.